What better night than a freezing Wednesday to try two of the newer beers to the Minnesota scene, 21st Amendment's Brew Free! or Die IPA and Monk's Blood. I have to force myself to type as I drink them, because my journal notes aren't thorough enough for a full post, and though I've had plenty of beers recently, I can't put together a coherent paragraph weeks after the sampling. So, for these reviews, I'll write what I think as I taste, and we'll see how that looks. I'll start with the IPA. The look: Classic cloudy melon IPA color. Almost like a glass of orange jello that's been dirtied up. Not much light gets through. Fair amount of head that dissipates soon after pouring. Good lace left on the glass, and yes, you should pour it into a glass. The smell: Again, classic IPA smell. Big aromatic hops; citrusy and grapefruit. There's something here though that I can't quite pinpoint, and it's a detractor. Almost like rotten fruit. Let's hope it doesn't carry over to the taste. The taste: Maybe if I could get that smell out of my brain, it wouldn't transfer to the taste. But it does. I even poured it into a different pint glass to make sure it wasn't the glass. It instantly latches onto my tongue, but luckily, doesn't hang around for much longer. Just tried a swig while plugging my nose. A little better. I will admit: this is the last beer from the six pack and the first where I've really noticed this off-putting aroma. I think I'll brush it off as an anomaly. Let's focus on the other flavors. It's balanced. Bitter, but not the bitterest. Sweet, but not the sweetest. Floral, but not the floral...est. It definitely has a sturdy backbone that a 7.2% beer must, but it's the bitter bite that is the lasting flavor. The mouthfeel: Fairly delicate for a beer of this content. Runs smoothly through the throat. There isn't much carbonation, so it's a little more flat and less sparkling than many beer drinkers might be used to. Overall, it's a pleasant visitor to the mouth. The drinkability: If it weren't for the rotten fruit factor, I'd say high. It drinks fast and leaves a good lasting impression. However, we can't ignore the most prominent characteristic, and I think a rotten taste would discourage me quite considerably. I liked the first four I had more than I liked the one I so closely scrutinized. Therefore, I can't pan it. I also know that it's a well-respected beer and of the reviews I read after writing mine, none mentioned a similar peculiarity. The one feeling many reviewers had was a hesitancy to expect a decent beer from a can. This is absurd. One of our favorite midwest breweries (easily the best in Minnesota), Surly, packages its beers in cans, and many breweries have gone to cans in recent years: Oskar Blues and SKA come to mind. Don't be afraid to love a beer from a can. First things first: a KILLER can. Although it's incredibly difficult to read the inscription (it circles the can in a small medieval font), it looks cool, and the monk's haircuts are spectacular. Let's crack this baby open. Here's the description given: a Belgian-style dark ale brewed with cinnamon, vanilla oak chips and dried figs. We'll get to the smell and taste in a bit, but first the appearance. The color is outstanding; it pours a deep purple and a full tulip glass maintains the purple, but looks pretty black next to the can. It's not a thick stout black, though. It looks more like a soda, with visible carbonation and a silky swirlability. Little head and virtually no lacing. The figs are the first and strongest smell. At first sniff, I wondered if I could distinguish it from a fruit beer, but upon further sniffings, the vanilla and the oak worked their way through. The figs are prominent, but they are subdued by the other elements. From the first taste, I'm pretty sure I'll like this more than the IPA. It's so silky, and the figs are delicious. The vanilla and cinnamon give it a sweet creamy texture and the Belgian yeast is evident, but not overpowering. It's warm, pleasant and so drinkable. This does not drink like a beer of its substance. 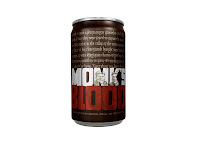 Even more than the slippery IPA, Monk's Blood slides down the throat effortlessly. This is the first release in the brewery's Insurrection Series (aren't all breweries doing limited edition series right now?). It most certainly won't be around for long. Do yourself a favor, go to your nearest bestest liquor store, drop ten bucks, and be a happy drinker. Oskar Blues was actually the firest microbrewer to can beer.